The Ideal solution: Simply overwinter your valuable potted plants outside! The tent is quickly assembled in the garden, on the balcony or the porch. The generous interior space offers lot of room for big and small plants while the excellent insulation of walls and ground element means maximum protection from adverse weather conditions and frost. 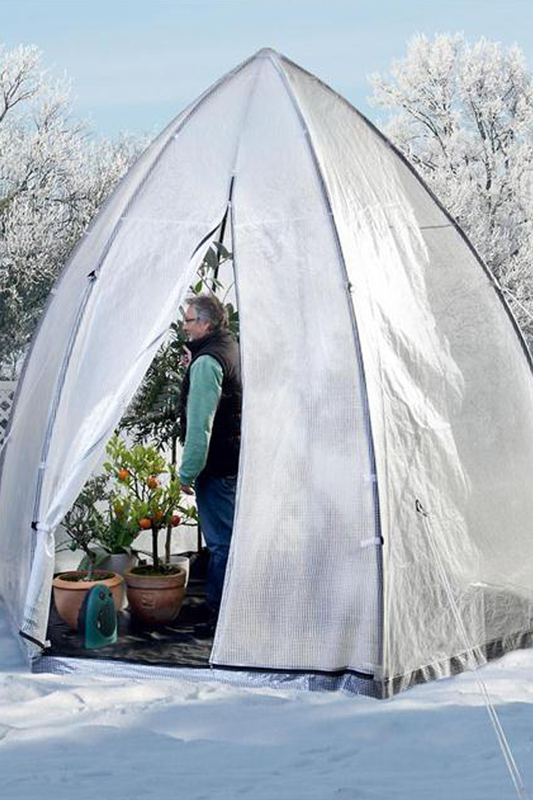 Inside this Overwintering tent your plants enjoy natural light all year round. Due to its robust construction, the plant tent even manages to withstand strong winds. This winter-tent makes taking care of plants during the colder months an entirely pleasurable activity: The UV resistant special PVC foil is light-transmissive. When opening the vent hole, you can easily provide the necessary air supply. Thanks to two entrances watering the plants is done in no time as well. No more hassle moving plants from your garden, porch or balcony indoors, and the plants do neither suffer from being relocated nor from changed lighting and air conditions. You can open the zipper and remove the ground element entirely. So you can use this Winter-tent for the early growth of vegetables and salad, for example, tomatoes in spring. The airspace and excellent insulation produce an ideal climate for the cultivation of plants. Perfect for garden friends who do not own a greenhouse yet. Comes with a handy bag. It is very robust and can be used again and again for many seasons. This winter-tent is a well-thought-out product and ready to use within half an hour.